A few afternoons a week when I was twelve I performed odd jobs for a small neighborhood grocery store with a creaky wood floor and a big bay window called Angie’s. 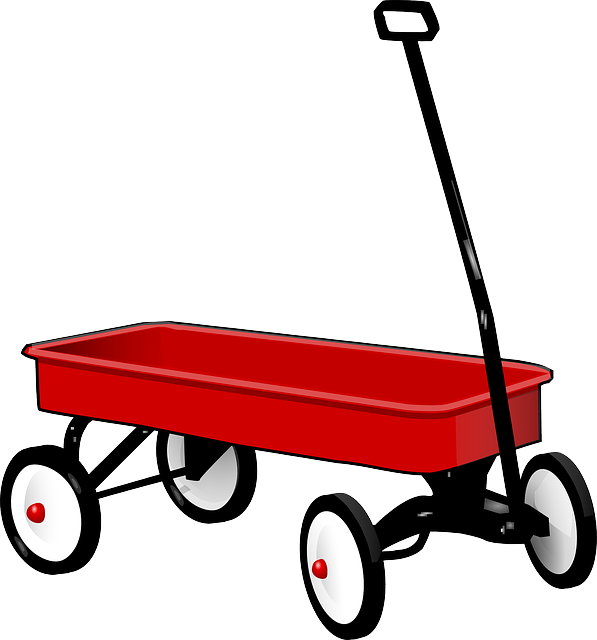 When I had a delivery to make I brought my red, hand-painted-by-my-father wagon around front and put the load in. Then I would charge, bound straight for glory down the narrow little streets whose every bump my wagon was friends with and had crisscrossed a thousand times, until I had turned a corner or was otherwise out of sight of Angie’s husband Mr. Costello, who spied like a penitentiary guard from the top step of the store to see if I was slacking off. I treasured my escapes to my happiest world that waited as loyally as a dog outside the store for me. I loved being out on the familiar streets alone, on my own, free, with no adults to burden or restrain me, and there like a person entering a garden after a long illness, relished being reunited with the hallowed fresh air and sunlight, the glorious shades and shapes that festooned this, the tiny patch of the earth that Fortune had so generously allocated to me, and the sights that pleased my eyes, and sounds beyond number that sang in the streets like minstrels. Delivering groceries was my favorite chore because it liberated me from Mr. Costello, whom I considered diabolical. Otherwise I would have to sweep the floors or shelve cans while Mr. Costello hovered menacingly over me, scowling and cursing, “Don’t do it like that kid, damn it, do it like this,” or, “Boy, turn the friggin cans so the customer can see the nice picture of peas on the front.” I didn’t think Mr. Costello despised me any more than he did anyone else since he treated everyone so miserably, without discriminating, including Angie–especially Angie. Almost all the people I delivered to were feeble old widows, worn to weariness by a long life and loneliness. They led quiet, solitary lives, having years before given up hope of leaving their apartment for fear of falling and being hospitalized and dying there alone. They had thin, emaciated hands with long fingers and translucent skin that was traversed by long knotted blue veins. They walked with backs bowed and in a slow shuffle—despondent women in perpetual mourning. Their slippers made shy whispering sounds on the carpet, and in the air about their apartments hung the stale and unmistakable odor of a human life approaching its end. Most every afternoon Mr. Costello, who had committed so many wrongs that it was impossible to remember a fraction of them, would go into the bathroom in the rear by the freezer and come out gussied up in dark silk shirts and two-tone shoes and brilliant yellow or pink ties. Smelling of sweet cologne, he would leave the store, walking in an arrogant strut. Then I would stand behind the shelves and watch Angie—singing softly to herself, swaying, dancing–as she glided, a seraph, through the narrow aisles. She was young and lithe; Mr. Costello was so old. Beautiful, Angie had such fire in her spirit that I felt it flaming out to me when I approached her. It singed me like molten tongs. She smiled with such sweetness, gentleness, guilessness, and goodness that it broke my heart. She was to me an Egyptian queen, and her hair, her voice, her hands, her presence, brought something into my life which I knew to be love. Because of her my life was purer and more beautiful, and when I stood close to her I could not breathe. When I dreamed, it was of her. When she was left alone by her husband, those were her hours of splendor, when she was set free and her spirit soared and she became the woman she truly was. But when he returned at sundown the day seemed to die and she surrendered and was transformed into a captive again. One afternoon after he had chastised me for being a dime short on a customer payment, and I had accepted his wrath wordlessly, terrified to speak, Mr. Costello left the store. Angie came down the stairs to the basement where I was weighing potatoes. In the dim half-light of the single overhead bulb, I looked at her lovely face and her large round breasts confined in a green cotton blouse. “Don’t let him scare you,” she said. I longed to ask, “Why don’t you run away?” and to thank her for her kindness. But being a child uncomfortable with both adults and words, I said nothing. She came close and held my face between her soft palms and kissed my lips. Then she touched my shoulder with her finger and turned and went upstairs. Soon I heard the little chime on the front door and Mr. Costello returning early and grousing that Angie had been sloughing off. The bread racks, the cases of produce, and soup cartons hadn’t been touched. “See ya,” Red said, and hustled up the street, tossing a baseball in the air that he raced to catch in his mitt. “See you, Red,” I called after him. On the way back to the store after the delivery, my wagon rattling noisily without a load, I realized that what meant so much to me–Angie’s kiss–was meaningless to her. She would surely forget it as quickly and completely as she would had she petted a kitten. I didn’t know then that my memory of that one moment would accompany me through all my life like a medallion that I would take out from time to time to admire, that once in a while something would remind me and I would wonder whatever had become of her, would wonder if we are ever granted a reprieve from our mistakes or must spend the rest of our lives paying for them. Billy Henson came running down the street and stopped me just about where Red and I had talked ten minutes before. “Did you hear what happened?” Billy said. Red Martin, I thought as I walked back to Angie’s, Red Martin. I had never really liked him that much, though I didn’t remember why. But I was remorseful and reproached myself now that he was dead. The realization that life was so uncertain and that for the first time death had come near to me and would again filled me with awe. Somehow, I thought, approaching the store, a death should be a more momentous event, something should change as a result, something should be different; the world should take note. But everything in my world of those streets, those sounds, those sights, those people, was the way it had been before. Everything the same–except for Red. Those same familiar streets shaded by the same cool poplars and elms, same cars slowly passing, same neighbors coming and going, same pungent smells of bubbling tar where muscular shirtless sweating workers with colorful bandanas toiled in the torrid sun, same red wagon buffeting noisily behind me; my returning again to Angie’s where cruel cologne-smelling Mr. Costello with his afternoon girlfriends and two-tone shoes and string ties would continue the daily torture of his wife. And where Angie would slowly metamorphose into one of the decrepit dying women I delivered to, and would sing gaily in the aisles of that little store like a bird lovely in its cage until the last end of her days came, as Red’s had come, and mine would come, and everyone’s would come. Lovely, David. I loved the image of his (your?) little red trolley and the freedom of being a child in the world for a little while without an adult. Death can come at any time, for sure. Sara, so good to hear from you. Where you are is summer. Where I am it is the dead of winter. The wind-chill this morning was a -35 degrees–snow falling, winds blowing, schools closed. I loved that sentence too in my post about no adults to burden or restrain me. Yes, that trolley (wagon) was mine. This sketch from my “Growing Up” stories, like all the others. happened exactly as I wrote it. There was a beautiful Angie, and a little store, and her kiss, and Red really died. (See my posts “The Origins of My Growing Up Stories,” “Days and Nights of Youth,” and “Days End,” for others.) In my post “The Artist’s Quest for Truth” I note that Ernest Hemingway’s truth was writing mainly what had really happened to him. So in that way I suppose he (my favorite author who grew up close to where I grew up) and I lack imagination because–I think like you–we choose not to tamper very much with reality, to make things up, but try to get things down exactly as they occurred, even to the minutest detail so that we might better understand what they mean to us. I take chances when I post my Growing Up sketches because they are not what people expect of me. But when my wife got me started writing a blog last summer–a foreign world to me– I asked her what I should write about and she said, “Anything at all you want; whatever takes your fancy. There are many sides to you. Express them” and that’s what I do just as in your posts you grace us with the many facets that make up this fascinating woman, this friend–Sara. David 🙂 I really cannot even imagine that kind of cold – surely people are not actually meant to live there! No wonder winter has such negative connotations in northern literature 🙂 Here – well, we’re kind of sick of the heat by then and are glad of a break! You are right about me – I don’t like to play around with the truth too much, in my writing or elsewhere. I was talking to a woman who said that she often thinks about the untaken paths in her lives and imagines stories around them, wondering what if. That sounds absolutely torturous to me :). I have played at writing fiction, but it’s very difficult for me. I love to read it though. I remember people reading a story I had written that was published and a woman exclaiming loudly, “This really happened.” Well it had really happened. And then a discussion ensued about whether you could call something that really happened a short “story” at all. And as I say, Hemingway might have been the greatest short story writer who ever lived and he wrote about what had really happened to him and made up very little. So what really happens to you and what happens to me in reality, with a few literary twists, can certainly qualify as “stories.” So without your knowing it you’re a short story writer and your stories have beginnings, middle, ends, and characterization and dialogue etc. So maybe this kind of “fiction” is not so very difficult for you after all. I can write totally made up stories with the best of them and make them sound real, and have had some published. But at the basis of a writer’s craft is memory, and if you’re a good writer, that memory-ability is very highly developed. Sara, you say you struggle. I think that’s very positive, because at least I have found that the more I struggle with my writing the better the writing gets. Because you are good right off the bat, you might expect the writing process to be easier than it is–or should be. I find that if my writing comes too easily and too fluidly, I get suspicious and think, “This is too easy. I’m being careless; I’m not giving it enough thought.” Virginia Wolff said that she wrote everything three times: the first draft to get the ideas down; the second draft to refine it a little, and the third draft to achieve spontaneity. I myself go through many more than three drafts.